Mamas-- summer is right around the corner. Time for kids camp, swimming lessons, and days at the park. 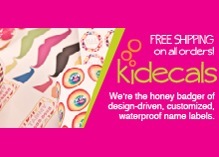 If you are as tired of buying new summer equipment as me, then you know why we are so excited to review for Kidecals. They are super because they will not wear out in the wash, so you can put them on water bottles, sunscreen, pool toys, or any other place that needs a decal! They also carry fantastic items like chalkboard labels (we love these for kitchen canister) and fun mustache stickers. By sharing Kidecals with you, MamaBreak will receive decals to review! We cannot wait!